MAIRÉAD Ní Mhaonaigh of Altan has been named Donegal Person of the Year 2009. The announcement was made at a Donegal Association function in Foley’s Bar, Merrion Row, Dublin last night. Mairéad, a qualified primary school teacher, is from Gaoth Dobhair. She formed the band Altan with Frankie Kennedy, going on to bring Donegal traditional music to a worldwide audience throughout the years. Altan celebrate 25 years in the music business this year. 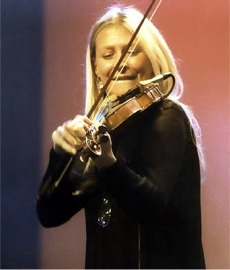 Mairéad lost Frankie to cancer in 1994 but continued with Altan at his request. The Frankie Kennedy Winter School now attracts musicians and tourists to the local area from around the world each year. Mairéad has also been nominated for this year’s Meteor awards in the 'Best Folk / Traditional” category. The Meteors will be held on February 19. Altan includes two members from Buncrana, namely fiddle player, Ciaran Tourish and accordion player, Dermot Byrne. The band has played a unique role in promoting traditional Irish music throughout the world. Mairéad will be inaugurated as Donegal Person of the Year 2009 at the annual gala dinner in the Burlington Hotel, Dublin, on Saturday, February 27 at 8.30pm. Tickets are available from any member of the Donegal Association committee. You can order tickets by emailing donegalassociation@eircom.net or by post to Sorcha Ni Dhomhnaill, secretary, Donegal Association, c/o Teachers Club, 35 Parnell Square, Dublin 1.